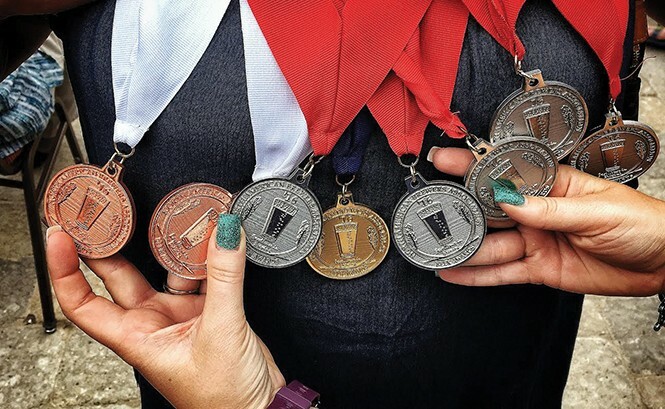 Sip on these award-winning Utah beers. The taste is flavor-forward with assertive biscuit toast and caramel. An herbal and grassy hay component rings in next from the hops, providing great balance. There's also some light apple in the finish. It's very easy drinking, yet complex enough to be enjoyed slowly. The taste here is almost sweet as it passes over the tongue. The malts are honey-like, and the hop bitterness screams citrus. The finish is slightly bitter with a minor sodium bite. There's very limited availability. The taste has toasted grain and minor yeast spices and balancing herbal hops. This is a simple beer that's executed very well. There were far more flavorful beers in this category, but this one beat them all. This Belgian-inspired IPA tastes bready and malty, with hints of citrus and clove. Some pine comes next, providing a dry, lingering finish. This one's for the more adventurous palate. Its nice, roasted, nutty flavor exhibits good balance with the abundant piny hop notes. There are hints of toffee and coffee in the end, as well. It's very satisfying and drinkable with a soft, medium body and dry finish. Lift your pint glass for Red Rock's most award-winning beer. To me, it tastes like a muted Tootsie Roll. Some berry fruitiness appears and then transitions to big, dry grass and pine bitterness. It finishes dry with a bit of alcohol heat. The nose has sweet malts, some corn and subtle grassiness. The taste is much like the nose, with sweet grains, cereal and hints of pear. It finishes with herbal grass-like hops. The taste starts with grapefruit peel hops. Next come enough caramel malts to balance out the hops. This is a nicely balanced IPA with no gimmicks. Starting with biscuit and orange peel, some lemon and apple peel come next, with phenolic yeast spices rounding out the the finish. It's more of a bière de garde than a saison. The sweet malts here are accentuated by notes of honey and mild yeasty fruitiness. Next come apple and floral hops, then crackery toast flavors with a mild bitterness to balance it out. It finishes dry. This is the second Utah beer to medal in the Belgian IPA category. Its taste starts with nice, spicy Belgian yeast that morphs to leafy citrus and tropical fruits. The Belgian yeast is subtle and not too overpowering. Taste here begins with toasty crackers and some lemon and floral hops. A light malty sweetness comes next, followed by a spicy/herbal bitterness toward the end. The finish is mostly dry with just a hint of sweetness. The taste starts with chocolate-covered raisins, followed by some underlying dark fruits. The sweetness gives way to big roasted coffee and cocoa, and finishes up with an enjoyable roasted vanilla malt. The alcohol is noticeable, but it doesn't taste like a 10.5-percent beer. Best part is, all of these beers are available now, fresh from their respective breweries. Cheers!